The background of this nail art is an incredibly subtle gradient of OPI Going My Way or Norway? and OPI Ice-bergers and Fries. 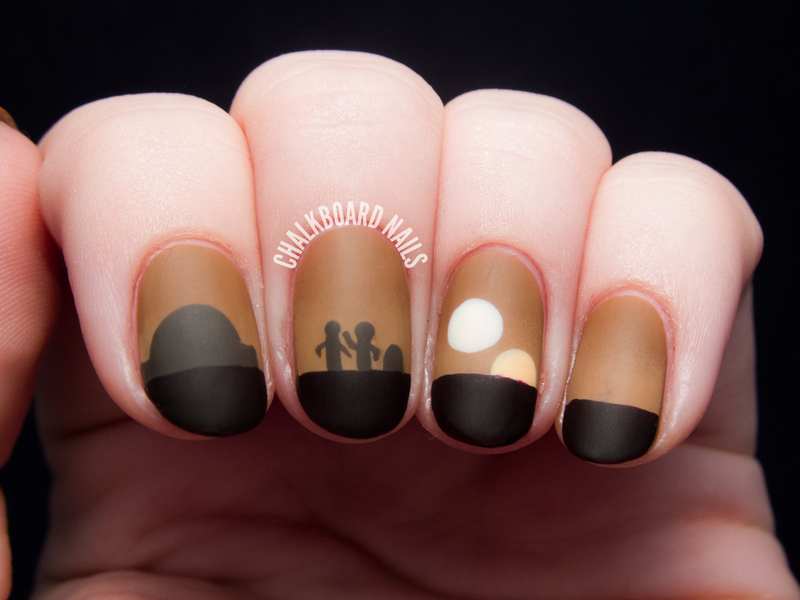 The silhouettes of Luke, C-3PO, R2-D2, and the Lars homestead were painted with OPI How Great Is Your Dane?. All three of those shades are from the new OPI Nordic Collection. I am loving the two caramel shades, in particular. The ground is painted with OPI I Sing In Color, while the suns are done with Lime Crime Milky Ways and Lime Crime Peaches <3 Cream. The manicure is finished off with OPI Matte Topcoat. This nail art ended up being pretty timely. A few days after I finished it, a group of us watched A New Hope! If only I'd still been wearing it that day. Are you a fan of Star Wars? Which one is your favorite? Very neat in planning and technique! What an awesome idea, and so perfectly executed! 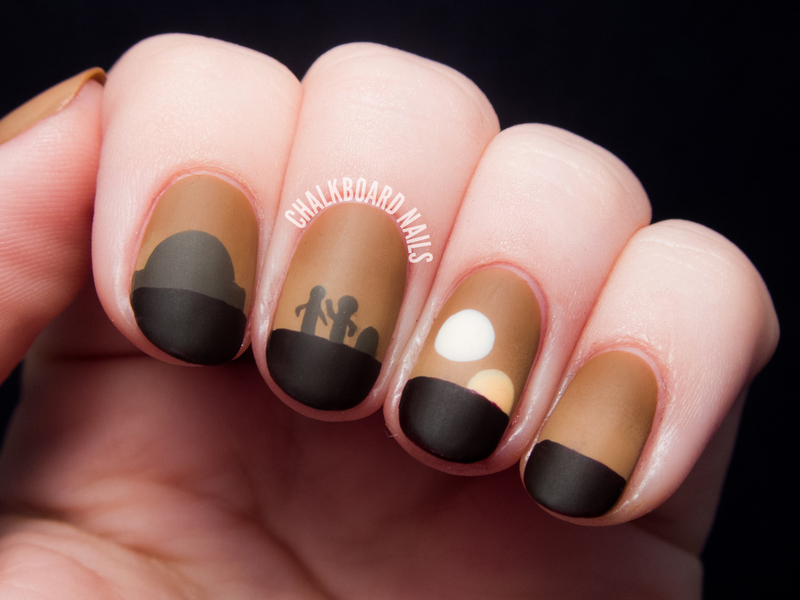 This is a awesome mani!! I love how simple but eye catching the nail art is! Aww thank you! My boyfriend is a mega Star Wars fan as well and he is the one that got me into the fandom. This is...wow. AMAZING. I love the simplicity and how evocative it is. So frickin' awesome! Love it, any Star Wars fanatic would be proud! This is great! Would I be okay if I copy this design for my 7 year old daughter's nails? 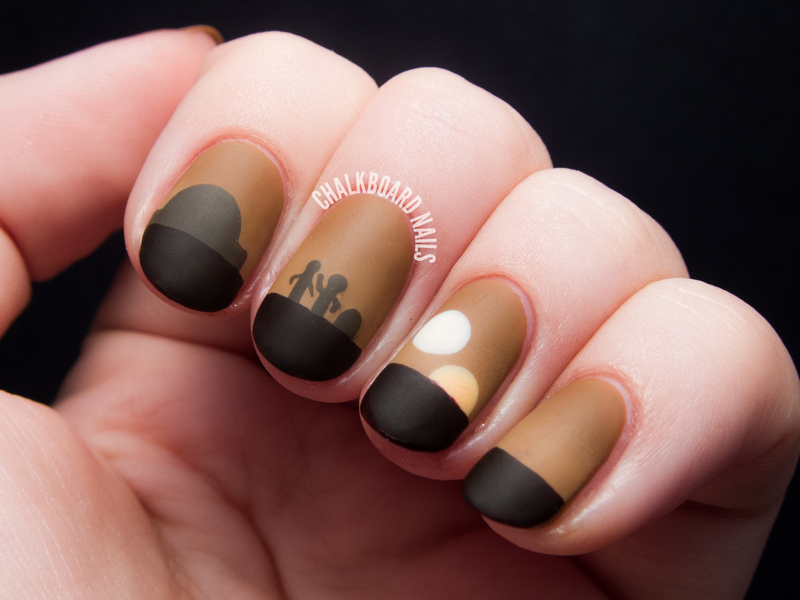 We'll be attending Star Wars Celebration in April and I came across your website while searching for star wars nail design.